Efficient, reliable and long-lasting – Jensen machines are about quality across the board. With more than 130 years of experience in the development and production of woodchippers, when you learn about Jensen’s diverse range of products, we can ensure you will find the exact machine for your needs. Jensen offer the widest range of woodchippers of any manufacturer, so whatever your requirements Jensen has a chipper to provide you with a long-term solution. Not only do Jensen offer a wide range of standard models, we can also custom-build chippers to meet your requirements, whether that’s front-mounted on a Unimog, a crane fed drum chipper or even a machine in your corporate colours and livery. Jensen is the only manufacturer in the woodchipper industry that offers turntable options for all of our 8″ to 12″ chippers, giving you complete flexibility in the specification of your new machine, whether it’s towed, tracked or PTO driven. Not only that, we are able to provide Jensen woodchipper parts and accessories for machines across the UK, and work with an extensive dealer network to provide servicing, maintenance and repairs for your Jensen models. With Jensen, you know you get not just the original and best woodchippers in the industry, you get honesty, integrity and exceptional customer service. Built without compromise, German-engineered Jensen chippers will provide you with a robust, long term solution for even the most demanding of jobs. Don’t believe us? Put us to the test with a free demonstration and find out for yourself! A definite edge on the anvil is just as important as it is to have sharp blades. A worn anvil puts substantial stress on the machine. Jensen anvils take just 5 minutes to change, with a small cover and 1 clamp bolt being all that are removed to enable access to the anvil. Not only that, Jensen anvils are double-sided for maximum efficiency. Jensen are the only woodchipper manufacturer in the industry offering turntable systems on all our chippers from 8 inches and up, making your job easier when working in tight spaces or along highways or footpaths where you need to control the angle of the infeed hopper. Turntable functionality also makes your jobs quicker, enabling you to leave the chipper hitched to your vehicle whilst still discharging in the required direction while you work. With a Jensen you can choose between a fixed or compact, fold down feed hopper. Both come equipped with a safety bar, which depending on the infeed control can be used as a control bar or an emergency stop bar. 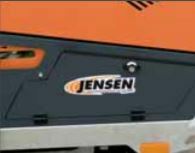 With very user friendly and safety conscious options, Jensen offers two options for feed control. 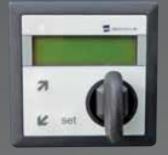 The manual hydraulic system removes the requirement for electrics completely, whilst the illuminated touch pad controls remove any possibility of water or vibration issues. The chipping blades can be resharpened and feature a double edge for optimal cutting and excellent chip quality. 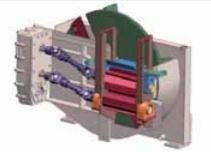 The blades are supported on the cutting disc to cope with extreme loads, and installation and replacement is a quick and simple job for any user. 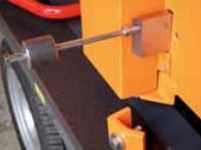 Designed to grip and take away the most awkward material, twin horizontal feed rollers are timed through a precision gearbox which allows the rollers to grip together on small brashy material, as well as large timber. 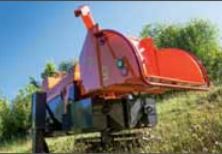 While other conventional chippers have a motor powering each feed roller, the Jensen chipper has one motor ensuring strong and consistent power to both rollers no matter the material. Available on the A425 model and bigger, Jensen offer a special double disc with comb system to provide high quality wood chips for energy and heating systems. After the blades have cut the timber the rotating flywheel throws the bigger chips into the chipping frame where they are crushed into smaller pieces between the fingers of the comb system. Jensen machines are designed to be robust enough to meet the harshest of field conditions. 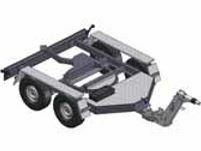 The use of steel for almost all components, from the feeding and cutting through to the chassis, ensure longevity and quality without compromise. 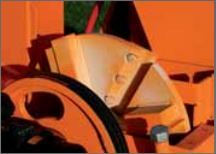 Jensen chippers endure shock, impact and heavy loads, providing you with much more than just your standard chipper. All Jensen chippers can be delivered with an auto overload regulator, which monitors the speed of the flywheel and prevents the timber from feeding onto the flywheel when the rotations fall below a preset level. This enables the engine and flywheel to build up speed again before the rollers are engaged to continue the chipping process, protecting your machine and ensuring a seamless process for users. The flywheel is the heart of every chipper. With a Jensen, clearing wet and green material is simply not a problem with blockages virtually unheard of, as a result of our open flywheel system. Two blades, which cut the full width of the timber mounted on a large flywheel with open taps means that there is nothing to hinder the chip leaving the flywheel. 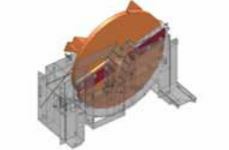 Four full width draught fins pick up the material and throw it out of the chamber rather than relying on air to blow the chip out. Jensen pride themselves on manufacturing chippers that are not just robust and efficient, but easy to use and maintain. Machines are built with panels and guards that fold out simply for quick and easy blade or anvil changes and maintenance, integrated well-equipped tool boxes and easy to use manuals. Not only that, Jensen offer a 3 year warranty on all machines, as well as parts stocked in the UK and UK based support available from the Jensen team and a network of Jensen dealers. Jensen UK is a trading name of T H WHITE Machinery Imports, part of the T H WHITE Group. As the sole distributor of Jensen woodchippers in the UK, T H WHITE Machinery Imports brings you the best niche products in the professional arboricultural market backed by an established nationwide network of dedicated machinery dealers.